Whether man-made sources of mercury are contributing to the mercury levels in open-ocean fish has been the subject of hot debate for many years. My colleagues Carl Lamborg, Marty Horgan and I analyzed data from over the past 50 years and found that mercury levels in Pacific yellowfin tuna, often marketed as ahi tuna, is increasing at 3.8% per year. The results were reported earlier this month in the journal Environmental Toxicology and Chemistry. This finding, when considered with other recent studies, suggests that mercury levels in open-ocean fish are keeping pace with current increases in human-related, or anthropogenic, inputs of mercury to the ocean. These levels of mercury – a neurotoxin – are now approaching what the EPA considers unsafe for human consumption, underscoring the importance of accurate data. With this article, I’ll explain the evolution of the science to this point and our findings. I expect our analysis will either quiet the debate or add more fuel to the fire. 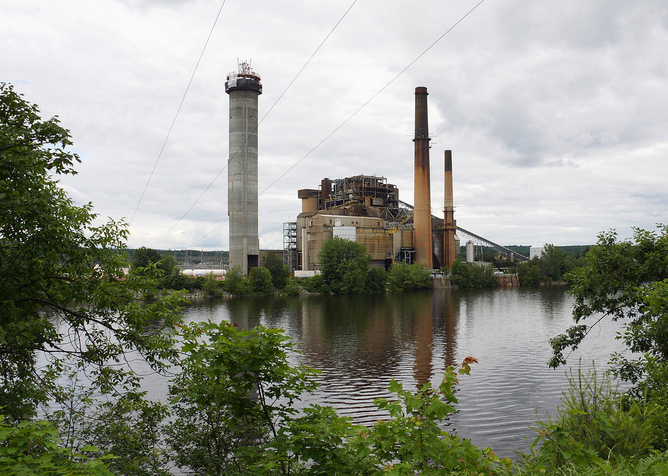 Motivated by the seminal environmental book Silent Spring, environmental chemists have long found widespread mercury pollution in wastewater from industrial activities. Surprisingly, mercury also appeared far from point sources – in “pristine” lakes of Scandinavia and northeastern North America. It took many years and careers to understand why mercury wound up in these “pristine” lakes. Once emitted from natural or man-made sources, such as coal-burning power plants, mercury can travel as a gas many times around the globe before falling with rain, snow, or dust. Once out of the air and in the water, it can then be taken up by fish. There has been a false perception, however, that the open ocean – far removed from point sources of pollution – is too voluminous to be polluted with mercury from atmospheric fallout. The shorthand for saying oceans can’t be significant sinks for air-borne pollutants is “dilution is the solution to pollution.” The argument is that lakes are concentrated environments because they are in direct contact with their watersheds that collect rain and snow, but the deep open ocean is an extremely dilute environment. It took years before people understood how airborne mercury from burning coal at power plants could accumulate in fish. Two manuscripts published in Science in the early 1970s supported this argument. The first stated that mercury pollution could only result in a negligible increase in mercury levels in open ocean water. But my colleagues and I found these conclusions were based on faulty data. Before the advent of clean sampling techniques that prevent contamination before, during, or after collection, it was accepted that natural mercury levels of open ocean waters ranged in the low parts-per-billion. We now know that a typical mercury level is about 200 parts-per-quadrillion. That means the natural mercury level of open ocean water is about 5,000 times lower than previously thought and that it takes a lot less mercury from other sources to pollute the open ocean. The second manuscript reported no difference in mercury levels in tuna between museum specimens dating from 1878-1909 and samples caught during 1970-1971. This finding may be true, but also has a critical error in that mercury levels in the museum specimens were not “corrected” for lipid (fat) loss. Mercury is primarily in fish muscle and preservation with ethanol causes significant loss of fats. The net effect is that this preservation technique “inflates” the mercury concentration in the tissue that remains. As a result, we question how valid these findings are. In other words, this second study doesn’t conclusively demonstrate whether mercury levels in fish have gone up, down, or stayed steady. More recently, the focus of debate has been on the source of mercury in open-ocean fish. The mercury absorbed by fish is a compound called methylmercury, a form readily taken up by plant and animal cells but not easily eliminated. Because of this, mercury is concentrated with each step of the food chain. As a result, methylmercury levels in predatory fish are about a million times greater than in the water in which they swim. In lakes, there is overwhelming evidence that methylmercury is formed in sediments and bottom waters that are devoid of oxygen. But where is methylmercury in oceans formed? In 2003, Princeton scientists published a hypothesis to answer the question of where methylmercury comes from in open ocean fish. 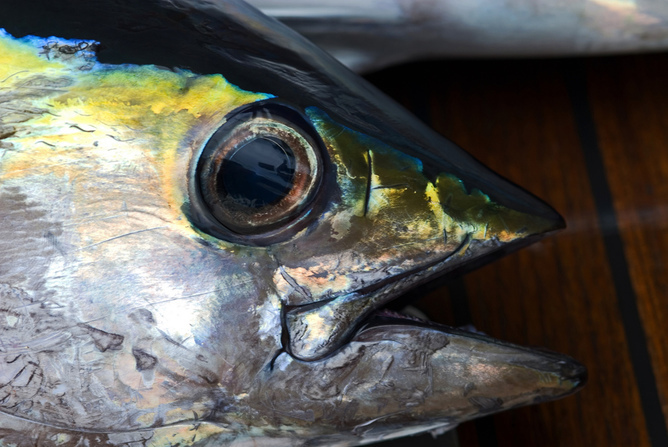 The hypothesis was based on the observation, mentioned above, that there was no increase in mercury levels in yellowfin tuna near Hawaii between 1971 and 1998. With no increase in mercury levels in tuna during a period of greatly increasing anthropogenic mercury emissions, the scientists presented the idea that methylmercury in the open ocean forms from mercury naturally present in deep waters, sediments, or hydrothermal vents. 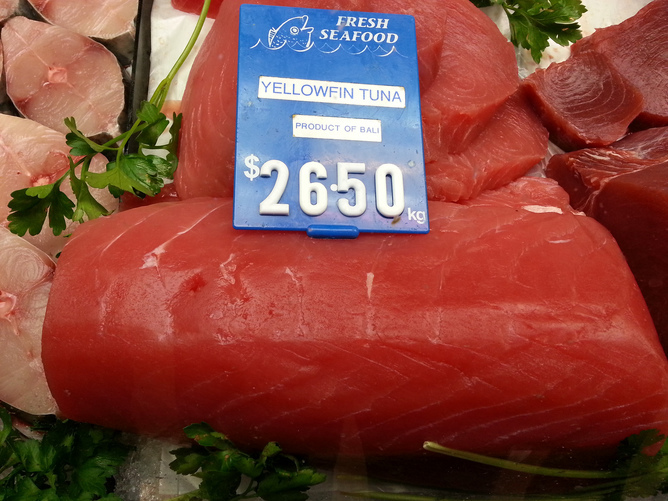 The level of mercury in yellowfin, or ahi, tuna is reaching unsafe levels set by the EPA. Subsequently, however, independent studies have shown that there is not enough methylmercury in deep waters of the ocean to account for mercury in open ocean fish. One of these studies also found that methylmercury is formed on sinking particles in the water that provide a micro-environment devoid of oxygen. That research showed that the methylmercury is formed from mercury coming from above – that is, the atmosphere – which we know is polluted from human activities. Finally and most importantly, we know mercury levels in ocean water are increasing globally. Given the ongoing debate, our study set out to test a simple question: have mercury levels in fish stayed the same over time? We assembled data from published sources for mercury in yellowfin tuna from Hawaii to compare three different time periods: 1971, 1998, and 2008. The comparison had to factor in the size of each tuna for each time period, because mercury level increases with size. The statistical comparison indicated mercury levels were higher in 2008 than in either 1971 or 1998. As a result, we concluded that mercury levels are increasing in yellowfin tuna near Hawaii. The rate of increase between 1998 and 2008 of 3.8% per year is equivalent to a modeled increase in mercury in ocean waters in the same location. What’s the source of the mercury? The overwhelming scientific evidence points to anthropogenic sources of mercury polluting open ocean waters and methylmercury being produced in the water column and then accumulating in fish. The average mercury level in a Pacific yellowfin tuna is approaching a level the US EPA considers unsafe for human consumption (0.3 parts-per-million). The ultimate solution to the problem is to control mercury emissions to the atmosphere at their source, which is the aim of the new United Nations Environment Programme’s Minamata Convention on Mercury.